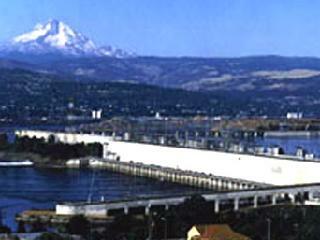 The navigation lock at The Dalles Dam remained closed today as contractors work to investigate anomalies in lock performance, but U.S. Army Corps of Engineers officials hope to have a better assessment of the lock's condition late today. "We did dewater the lock and so we are conducting an inspection with the contractor," said Diana Fredlund, a Corps spokeswoman. "A team of engineers from our district, plus some from Walla Walla district and others from the region are giving us all the help they can to get the job done well, promptly and right. Once that's done, we'll be able to estimate how long the lock is going to be closed." Gauges on the lock gates indicated that stresses on the gates had changed, but Fredlund didn't know if they'd gone up or down. "Neither of which is good," she said. "Even if the stress level goes down suddenly, it means the stresses are going someplace else, not going away." Contractors are working 24-hour shifts to investigate the issue, Fredlund said. The closure has caused a bottleneck in river navigation and commerce since it closed Tuesday. For example, a pair of tour boat companies -- one upriver from the lock and one downriver -- traded passengers to allow guests to continue their journeys, according to local reports. The tour companies did not return calls Friday for further information. In a typical year, about 10 million tons of cargo moves through The Dalles lock, valued at between $1.5 billion and $2 billion, according to Glen Vanselow, executive director of the Pacific Northwest Waterways Association. "This kind of lock outage -- short-term -- very clearly there are expenses," Vanselow said. "Tow boats en route that got stopped, product waiting to move. It's much harder to put an economic value on day-by-day losses. Clearly, tow boat companies and folks storing grain extra time -- there's a cost associated with that." The lock at The Dalles has been in place for more than 50 years. Vanselow indicated that the Corps has announced funding for major work on The Dalles lock beginning in December 2010. Major work is also planned at John Day and Lower Monumental dams. "[The Corps] knew there were cracks in the lock gate and they've been tended to and temporary repairs instituted as needed," Vanselow said. "I'm assuming that's what is going to happen with this current closure to get through to December 2010." The decision to close the lock had to be made to assure the anomalies didn't result in an irreparable problem, Fredlund said. "I think everybody understands how important this is," she said. "We don't close the lock lightly." Vanselow praised the Corps of Engineers' response to lock problems. "The Army Corps of Engineers does of great job in responding to these kinds of problems," he said. "They are out in full force, doing everything they can. We have had other times like the accident at John Day that caused the lock gate to be damaged. They do an awesome job of keeping what is now a fairly old infrastructure maintained and working."